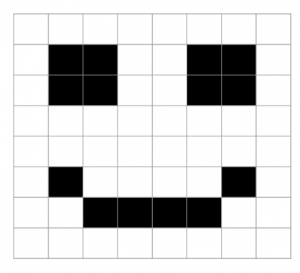 Have a go at creating a smiley face in the grid bow below! 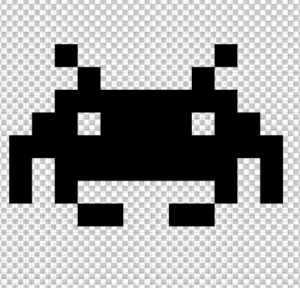 A bitmap image is a image that is represented by a grid of square pixels. In a black and white image, each pixel can be either black or white. The total number of pixels in an image is known as the resolution. For example, an image that is 500 pixels wide by 500 pixel high has a resolution of 250,000 pixels ( or 0.25 megapixels). Moderns cameras take pictures over 20 megapixels in size. That’s a lot of pixels! Bitmaps have a small storage size, compared with the amount of data being stored ( especially when combined with lossless and lossy compression). This means that you can take a lot of images using just one SD card. 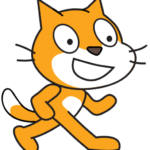 Bitmap images can be displayed very easily on computer screens, so your computer doesn’t need to use a lot of processing power just to display the image. Most operating systems and internet browsers can display bitmap images with the need for specialist software. 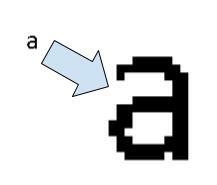 Bitmaps can only be enlarged a certain amount before the image becomes blurry or ‘pixelated’. Lossy compression can damage images, resulting in defects on the image. Representing a bitmap black and white image in binary is easy – starting at the top left of the image, and working you way across and then down , you write a 1 for each black pixel and a zero for each white pixel. Have a go at this pairs activity. You will need to print out the worksheet, unless your teacher has already printed it out for you!